Gonna start with this: This issue alone should be picked up just for the “F&*^ Yo’ Couch/ Rick James- Charlie Murphy” moment featuring Cyborg fighting robot drones, and an extremely frustrated Dr. Stone. 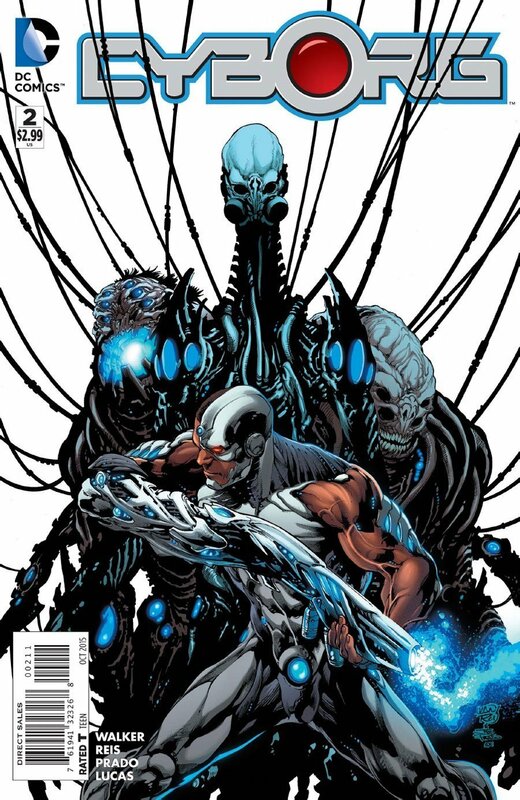 As the story progresses we see Cyborg grappling with nightmares of his battles with the Technosapiens (with a great few pages of action), while in the real world further attempting to test out his newfound abilities/ upgrades. One of these moments involves a pretty humorous scene featuring Cyborg flexing his tech muscles for a cat which shouldn’t be missed. On the more serious action oriented end of the “testing out abilities” spectrum we have a beautifully drawn scene of Cyborg fighting against a set of robots at S.T.A.R Labs. This scene in particular works on a variety of fronts. First the action is beautiful to see here. Reis, Prado, and Lucas put in some really good work with this sequence, as we get a sense of how much Vic is testing his limits. He’s frustrated with his aloof father, still grappling with his recent death/ resurrection, but at the same time is dealing with all of it in his own way. In this case it’s through destroying pretty high priced robots, but hey you take what you can get. Also loved the moments of Cyborg at home, and meeting his fans. It’s always great to have parts like these where these larger than life figures are just human. The side story involving Bobby being fitted and receiving a cyber-prosthesis limb, and a missing eye through the assistance of questionable “body shops” is a good parallel to Vic’s own internal discussion of the mixing of man meets machine. It’ll be interesting to see where Bobby’s story goes especially in light of how the issue ends. In addition to this more of the war of the Technosapiens /Tekbreakers war is fleshed out, and how their conflict might potentially intertwine with Cyborg’s journey. All in all a really good continuation of the foundation laid in the first issue.